How to properly microdose safely with LSD and psilocybin? How many hours or days does a microdose last? Can you microdose to have freedom from depression? What about anxiety? Is microdosing LSD the ultimate trick for your life? You might have heard the term “microdosing” that is taking the world over by a storm. You might have heard of LSD and Psilocybin mushrooms. Even if you have not heard of them, or if you have and you’ve been curious to know how to microdose these substances, here is almost everything you wanted to know about microdosing at Psychedelics Daily. We’ll dive into some questions such as, what is a safe microdose of LSD and mushrooms? How many hours or days does a microdose last? How to properly microdose safely with LSD and psilocybin? Can you microdose to have freedom from depression? What about anxiety? Is microdosing LSD the ultimate trick for your life? Microdosing is not something new. 15 of the 20 largest pharmaceutical companies use microdosing to test newly developed drugs. Microdosing is the method for observing the behavior of drugs in organisms through the administration of doses which are very low (sub-perceptual or “sub-therapeutic”). These extremely low doses are unlikely to produce full-body agonism, antagonism, and effects, but strong enough to allow the cellular response to be observed and studied. Microdosing is when substances are tested for their pharmacological effects through the administration of “sub-perceptual” doses. Sub perceptual means that the awareness of the intoxication is below the level of conscious perception. The individual is not even aware that he is being effected by the drug. 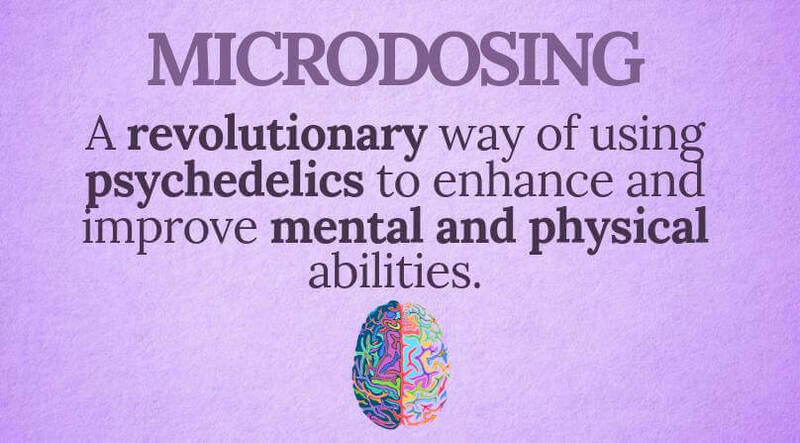 The “effective” dose produces a full effect, however, microdosing is only enough to produce a partial effect. The psychedelic doses are not enough to make the person trip and they remain fully functional, and their mental and physical abilities are enhanced. With a microdose you don’t trip! You don’t get hallucinations or feel a body laod. You are 100% fully functional, as the level of intoxication is sub-perceptual. Check out our guides to microdosing LSD and Psilocybin mushrooms. Please read the guides in full and ask any questions that should arise by contacting us. Read about the Best Microdosing Schedule for your regimen by Dr. James Fadiman! Don’t forget to check out the Benefits of Microdosing and all that it has to offer you. Psilocybin and LSD were first extracted by Dr. Albert Hofmann, a Swiss chemist. He was the first person who introduced the concept of microdosing psychedelics to the world. He also said that this needed proper scientific research by psychiatrists. Dr. Hofmann had been microdosing for decades. He lived to the ripe old age of 102. It is said that even at age 100 he was giving lectures and talks spanning more than an hour. Hofmann said that he would micodose and take walks in the woods to clarify his thinking. He was certainly enjoying microdosing LSD benefits to an old age. The daily diets of indigenous shamanic cultures include psychedelics. They are always on a microdose, which makes them better hunters and gatherers. We’ll shed more light on the evolutionary and anthroplogical aspects of microdosing, which reach far back into human evolution in upcoming articles. A microdose of LSD and/or mushrooms is considered to be 1/10th to 1/5th of the affective dosage. The microdose can range depending on metabolism, body weight, and dietary habits. It is recommended to start low and work your way up. You can always take more, but you can’t take less once you’ve taken more! In the case of LSD, the effective dose is 100ug. In the case of Mushrooms, the effective dose is 2.5 grams. Dividing these by 10 and then by 5, we get 10-20ug for LSD, and 0.2 to 0.5 grams for mushrooms. Check out our guides to learn microdosing in detail, but in summary, you can measure out 100ug of LSD in 100ml solution, and 10-20ml would be a microdose. For mushrooms, measure out a gram, and mix it in 100ml ethanol (alcohol such as Everlcear) and 25ml of that solution would be 0.25 grams which would be a safe microdose. To microdose LSD tabs, drop 100ug tab into 100ml of distilled water or ethanol, and let it dissolve overnight. Now, 10ml solution would have 10ug of LSD. To microdose mushrooms, drop 1.0gram of dried and ground up (powdered) psilocybin mushrooms into 100ml distilled water or ethanol (alchol is preferred) and let it dissolve. 25ml solution will contain 0.25grams of psilocybin. A regular dose of psychedelics such as LSD or Psilocybin lasts up to 12 hours, but a microdose on the other hand showcases a peculiar yet welcomed effect that it lasts for up to 4 days, according to Dr. James Fadiman, the leading authority on Psychedelic Microdosing. Absolutely. Psychedelic microdosing is replacing antidepresents. Though not always, we can safely replace antidepresent medications and ween ourlselves off SSRIs completely. The trick is in how psychedelics target the serotonin receptors directly, as opposed to SSRIs inhibiting the serotonin reuptake. The Internet is full of articles and first hand experiences of people who are now much happier and prosperous due to lsd and psilocybin microdosing. It certains seems to be the case for Silocon Valley. Many programmers and software developers, engineers and even doctors are taking LSD in microdoses to improve their lives, to be more productive, have more stamina and energy, and be better at their jobs. A microdose is 1/10th to 1/5th of the effective dose. The effective dose of LSD is 100ug. The effective dose of mushrooms is 2.5 grams. One of the most accurate methods of measuring accurate microdose for safe dosages is Volumetric Dosing. “Volumetric dosing is the mechanism by which a compound in dissolved in a liquid to make it easier to measure”. In the interest of psychedelic drug harm reduction, it is important to use volumetric dosing with certain compounds which are too potent to measure with traditional weighing scales. This method makes it possible to use a cheap $30 scale and still accurately measure to only a few milligrams. You may have noticed that I mentioned 4-AcO-DMT in the microdosing table. 4-AcO-DMT is O-Acetylpsilocin. Albert Hofmann acetylated the 4-HO-DMT (Psilocin) molecule in order to stablize it for long term storage and to study the deacetylation upon dosing. 4-AcO-DMT is equivalent to dry 4-PO-DMT (Psilocybin) mushrooms in the following amounts: 10mg of 4-AcO-DMT (and many other 4-substitued Tryptamines) is equal to 1 dry gram of mushrooms. A lot of people find that Psilocybin mushrooms range in potency, depending on the particular strain and cultivation methods, so they tend to prefer 4-substited tryptamines because they can more accurately control the dosing. The dosages for these tryptamines varies, and we’ll be publishing detailed guides about them in our microdosing section soon. Check PsychedelicsDaily.com often to see new articles posted daily! Sub-perceptual doses are the most under-researched area of psychedelics. Who could have said it better than the man himself? Currently, MAPS leads the way for psychedelic research in the United States. We need to study long term effects of microdosing, disadvantages, dangers, and long term mental health effects. Another important question is, can psychedelics cause mental illness? We’ll go into this question in another post. Grassroot organizations need to have and encourage a rational and scientific discourse around responsible psychedelic use to counteract the abundance of disinformation and government propaganda rampant for the last 80 or so years. We ask you to share this article with everyone you know. We believe that the more people know about the benefits of microdosing and psychedelic substances, the sooner we can bring them out darkenss and into the public sphere as proven medical treatments for a variety of conditions.